Mary was born in Taunton on July 29th 1955. She was raised in Taunton where she was a graduate of Coyle and Cassidy High School. 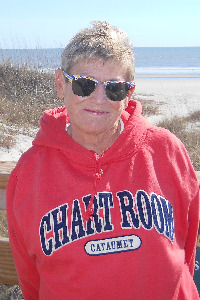 She also received a Bachelor’s Degree in Business from St. Michael’s College in Winooski VT. Mary loved going to the beach and loved to travel. She loved all things Disney. Mary visited Walt Disney World in Florida and Disneyland in California numerous times. She also enjoyed traveling on the Disney Cruise Line. She enjoyed a nice game of golf, although she found it frustrating at times, and loved dining out. Prior to retirement, Mary worked as a field auditor for the Office of the State Auditor for over 20 years. Mary was well loved and will be missed by many. Mary leaves behind her loving husband Gerard J. Gamache. Jr. of New Bedford, as well as her sister; Kathleen Curley of Taunton, and her 2 brothers; Edward Curley and his wife Sarah of Taunton and Sean Curley and his wife Sarah Elizabeth of Waltham. Mary also leaves behind many nieces, nephews, great nieces and great nephews.